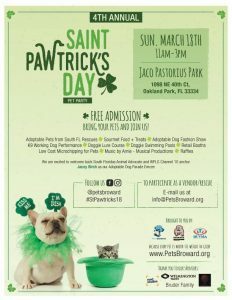 Come and join us for our 3rd annual Saint Pawtrick’s day pet party! We’ll have delicious food, lots of adoptable pets, music, low-cost chip service, doggie lure course and fashion show and so much more! Bring the family, furry or not!